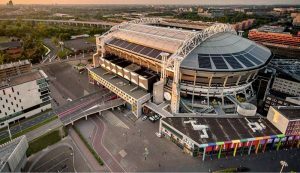 The Johan Cruijff ArenA is already one of the most sustainable, multi-functional stadiums in the world and is realizing even more inspiring smart energy solutions for the venue, it’s visitors and neighbourhood. The Johan Cruijff ArenA presents a complex order of magnitude for innovative energy services, with a consumption of energy comparable to a district of 270 households. Thanks to the 1,128 MWp solar installations on the roof of the venue, the Johan Cruijff ArenA already produces around 12% of the energy it needs, despite the high-power consumption during major sport events and concerts for up to 68.000 visitors. The other share of electricity is generated through certified regional wind energy. The Johan Cruijff ArenA has invested in energy storage and V2G applications, which will be realized in the summer of 2018. The vast renewable production ensures a massive supply of clean energy to charge EVs, which translates into an increase in clean kilometres for their visitors. The Energy Storage System is unique; as it’s the first time different applications are combined in one system. Currently, all systems are single purpose applications either focusing on building support or grid services. The Energy Storage System of the Johan Cruijff ArenA will address several applications in parallel. Replacing traditional energy plants is the main emission reduction contribution along with load management, peak shaving, back-up services and V2G support. The solar panels, the energy storage system, the new main distribution panels and up to 8 bi-directional EV chargers are connected to the Energy Storage System which means in the future electric vehicles can power events and be charged with clean energy through the Johan Cruijff ArenA’s Energy Services. These and other experiences and results can serve as a development model for other stadiums worldwide.